Treat yourself on laundry day! Raise your hand if you look forward to laundry day! No? We’re guessing that many of you dread it, not just because of the piles of dirty clothes waiting to greet you, but the mere thought of washing, rinsing, and drying can be tiring. Perhaps this is one of the reasons why laundry services have been opening all over the Metro—to give busy people a well-deserved break from this chore. What’s even better? There are laundromats that offer drinks and snacks so you can fully relax and let the washing machine work its magic. Planning to try a laundry service near you? “At Paddle Laundry Lounge, we do laundry, you do life!” That’s the tagline of this quaint laundry shop found inside the Pioneer Street Market. The place itself stands out—it’s all-glass and looks like a typical bar. Aside from scheduling a date with the bf (or bff!) 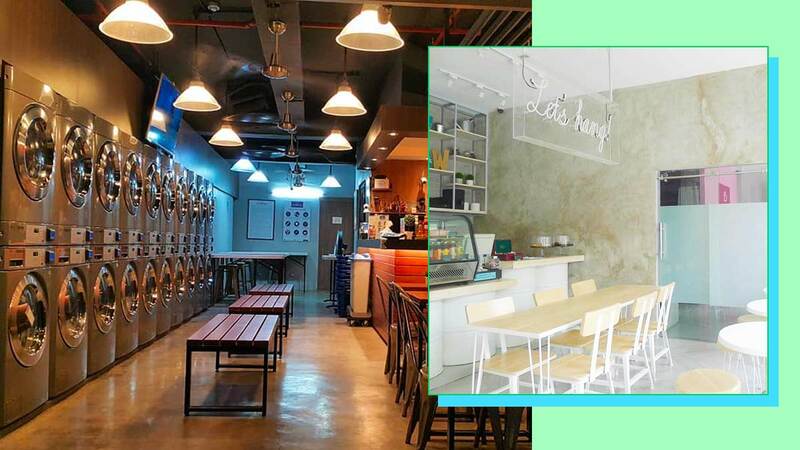 here (there’s a variety of drinks and Pinoy favorites like Sisig available! ), you can bring a hamper full of clothes and let the huge washing machines do all the work. Paddle Laundry Lounge is open 24 hours.